Canon MX882 pixma is the really all in one wireless inkjet printer, because we can print all document from any room in our office, integrated with 35-sheet auto duplex document feeder, connect from many WiFi devices likes desktop PC or notebook, and we can print photographs directly from our android. 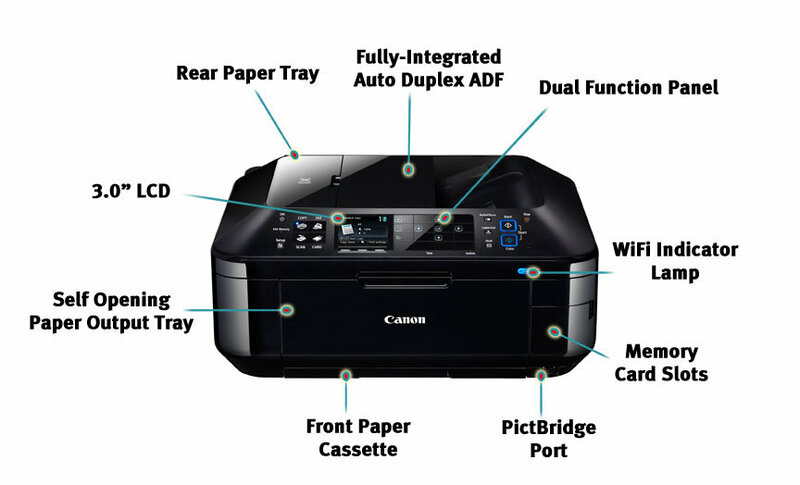 The Canon MX882 brings amazing quality, speed and easy of use to your business. It is the best choice for people who want to increase home office productivity and efficiency. This pixma printer has a USB port and memory cards slot, so its makes easy for us to load photos from a portable flash drive or SD Memory. If you have the collection about many favorite HD movie clips, Canon MX882 options now also expand to Full HD Movie Print with quality photos up to 8.5″ x 11″ in size and print a border-less, 4″ x 6″ for only 20 seconds. The Canon MX882 operates with five ink cartridges; so when one specific color runs out, we just need to change that one cartridge and not the entire array. I also noticed Canon pixma MX882 installs easily to reach ‘shortcuts’ on your desktop PC to manage simply your function for your printer. This Canon MX882 printer which Dual Function Panel feature has useful function to transform into a keypad in fax mode. The scanner worked beautiful, as I was quickly able to scan an old photo and upload it to my notebook for easy sharing. It is produces 2400 x 4800 dpi high quality scans for amazing image detail. In a nutshell, Canon MX882 pixma is very user-friendly and it has excellent quality of the prints and fax. Another think you must know is Canon has an excellent customer support, so if you confuse to figure something out; do not hesitate to contact them. Canon MX882 has great rating and more than 250 satisfied customer reviews, what costumer say about this all in one wireless printer?